Your mother and I struggle to keep updated photos of our family on the walls. 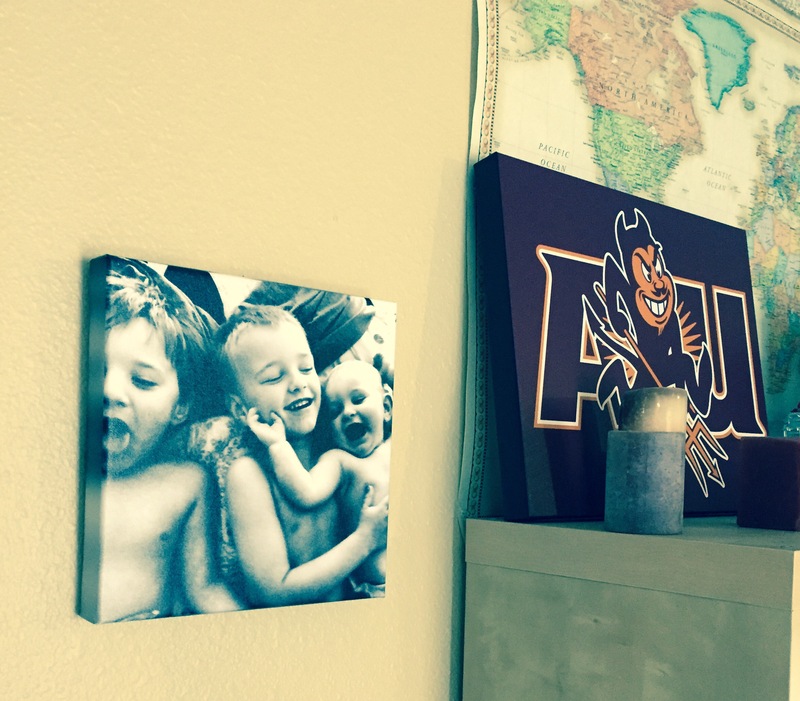 Personally, I have a hard time understanding the custom of decorating your dwelling with pictures of the people who stay there. It’d probably be good for someone suffering from Alzheimer’s, but me- I know what you all look like, and with the amount of attention you draw to yourselves, I don’t think I’ll forget your faces any time soon. That being said, maybe the purpose of having the photos up is to remind ourselves that, even for a fraction of a second, you have the ability to sit still and look clean. One of the other issues is that it’s hard find the right frames to hang pictures in. We’ve received frames as gifts, and after politely thanking the gift-giver, your mother and I make eye contact and telepathically message the words “garage sale pile” to each other. We’ve bought elaborate frames we thought would look good in our home only to find that they don’t, and we’ve had frames we like fall victim to games of household dodgeball that I definitely had nothing to do with. That statement might make practical sense, but it doesn’t necessarily fit with what is conventional and customary. Picture frames were our original, pre-Instagram, filters. The frame- the way something is packaged, presented, garnished, adorned and embellished often matters as much, or more, than the product it’s attached to. Jesus is Jesus, and a burger’s a burger, but that doesn’t stop churches and restaurants from constantly repackaging what they have to sell in the most culturally relevant and easy to digest manner. You may have heard the old cliché “don’t judge a book by its cover,” but a publisher doesn’t care if you do or don’t judge- they care if you do or don’t purchase. The majority of our energy goes into our various frames now, whether it be our resumes or social media profiles, the true pictures have gotten lost in the fray. Your mother’s new frame-free philosophy inspired this letter- and I’m going to give away my hand right here and now. I’m using frames as my frame. This whole thing has just been a device to present to you the idea that presentation, while very important, is not where your focus should lie. In your life, people will frame things differently to suit their various purposes. If you want to make sure that you remain conscientious (and conscientious is an extremely good thing to be), you’ll seek out objectives instead of being distracted by their adornments. The people in your life will dress, talk, believe, love, hurt and interact differently, but no matter what you think of the frame they come in, remember, the thing they have in common is that they’re the people in your life. Recognizing the commonality despite differences in those closest to you will open you up to treating the not-yet close to you with dignity and decency that isn’t reliant on peripheral details about them (that you may or may not naturally feel drawn to). My hope is that as your father I can put this into practice for you to see. I don’t care if you don’t like sports, or that you won’t eat meat, or that you get angry sometimes. At the end of the day, I want you to feel like nothing mattered more to me than the fact that you’re my sons- not the way you talk or act or dress, or if you’re a little strange, or what you achieve in the classroom or on the football field. Your frame doesn’t have to match my tastes. I have the full picture. Next Post: 5 Things I Love About the Seahawks and Why they Matter to You. I love it. We live too much in our frames and don’t remember to look inside and we buy things just because of how they are packaged. How very true your post is! I love the clever and creative ways you guys choose to teach some of life’s important, and often overlooked, lessons. This was posted to The Dad Letters last week, and it’s pretty corny, but a necessary lesson for my kids on focusing more on who they are than the image they project.